I’m sure you’ve noticed that I’ve been super active on social media lately. I’ve always enjoyed helping others but, like most of us, was too busy with my usual workload to be able to help others as much as I’d like by answering SEO questions in online communities, sharing my knowledge and experiences, etc. Figured it was now or never and in the last couple of months I’ve scheduled time throughout the day towards nothing but social media engagement and helping others. And now I’m starting to get messages of appreciation, like the attached. 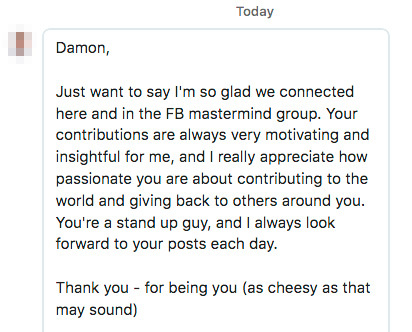 While I’ve found success with SEO National and I am happy with the rewards I’ve received in life, these small tokens of appreciation from following my passion for helping others is beginning to offer a whole new form/experience/appreciation for a different type of reward. You all matter and can all make a difference. And you never know who your efforts will touch.